We had a fab two days with Lilian. She exceeded my expectations of what a tour guide would be. Lillian was welcoming, friendly and very personable. The tour of the Argentinian and Brazilian side of the Falls is a lot of walking and Lillian let us set the pace, which we were grateful for. 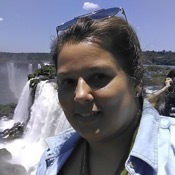 Lilian took all the "hassle" out of everything from customs at the Argentinian/ Brazilian border to deciding which was the best route for us to take through the Falls. Great tour definitely "Top Nonch"
TOUR GUIDE RESPONSE: Thank You Sharon, you guys were great, I also had an amazing time showing you around... And I get so happy when I can make you happy as well... Hope to see you and Neill again!!! Best Regards, Lilian.